Although the US Army adopted the first model of the Warner & Swasey Musket Sight in 1908, it was not selected for service by the Marine Corps. The marines were not particularly looking for a ‘sniper rifle’ but were interested in obtaining a scope for use on their rifle team weapons for competitive match purposes. When Winchester introduced into the market its A5 (5 power) telescope in 1910, the USMC decided that this was the scope it needed for its competitive ’03 Springfield match rifles. 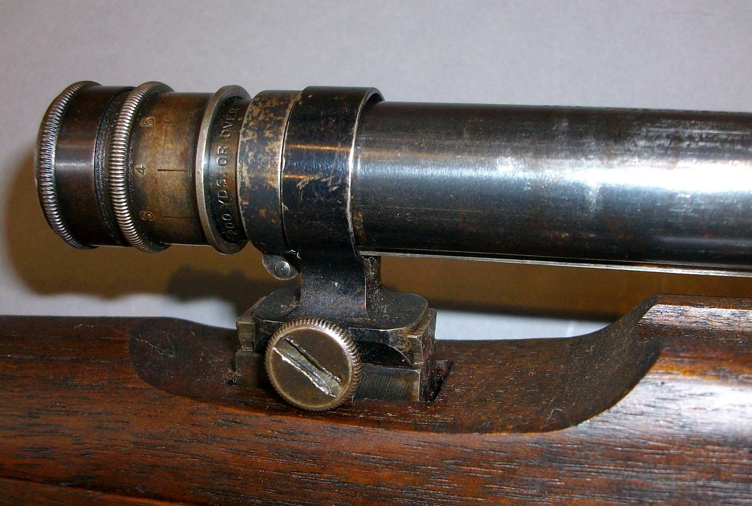 Winchester’s telescopic sight was developed from Prof. Hastings optical calculations and patents were obtained in 1907. The scope weighed 10oz, the tube was 0.765 inches wide and was 16 inches long, with a field of view of 18ft at 100 yards and although it looked fragile the tube was very strong, being machined from the solid and not drawn. 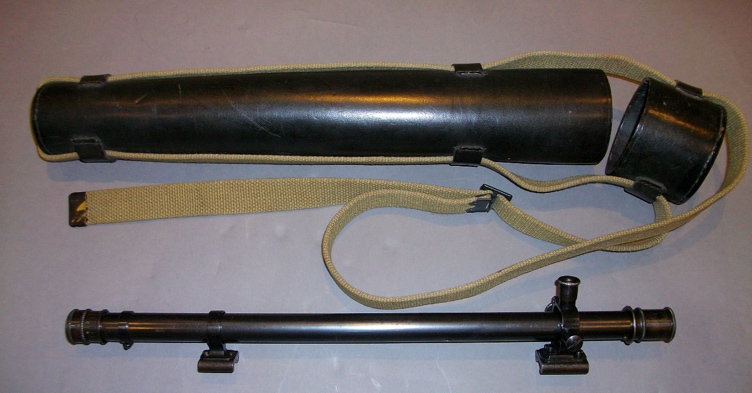 A number of standard commercial Winchester A5 telescopes and bases were acquired by the Corps and mounted by marine armourers at various ordnance depots for use by the rifle teams. The exact number of Winchester A5’s purchased varies, but it is believed to be approx. 500. Many of the early examples favoured a 6” centre between bases – the position of the scope reflecting the want of the individual shooter. The rear base attached to the ’03 sight base, with the sight removed. In order to mount the front base, it was necessary to cut down part of the handguard to clear the base mount. 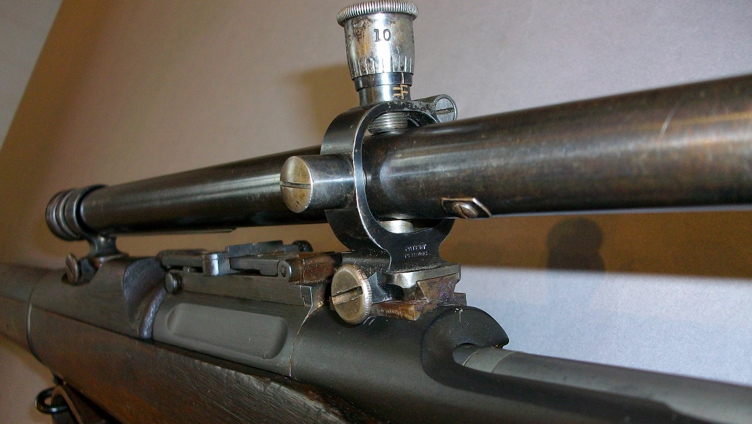 Rifles converted later and through WWI had the rear base mounted on the receiver ring producing a firmer mounting platform and a 7.2 inch spacing between bases, which became the norm. The standard single cross-hair pattern was the favoured reticle. 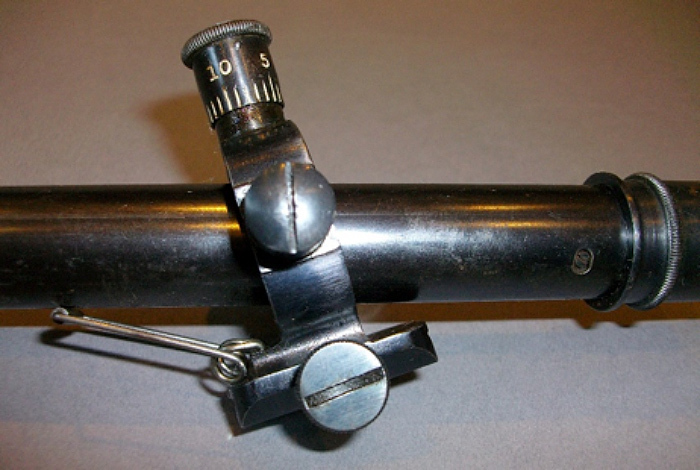 A locking stop ring located between the front mount and the objective end of the scope positioned the sight for correct eye-relief (approximately two inches) when pulled back into battery after firing. The Marines also adopted ‘Mann-Neidner’ bases to mount Winchester A5 scopes on their match target rifles. 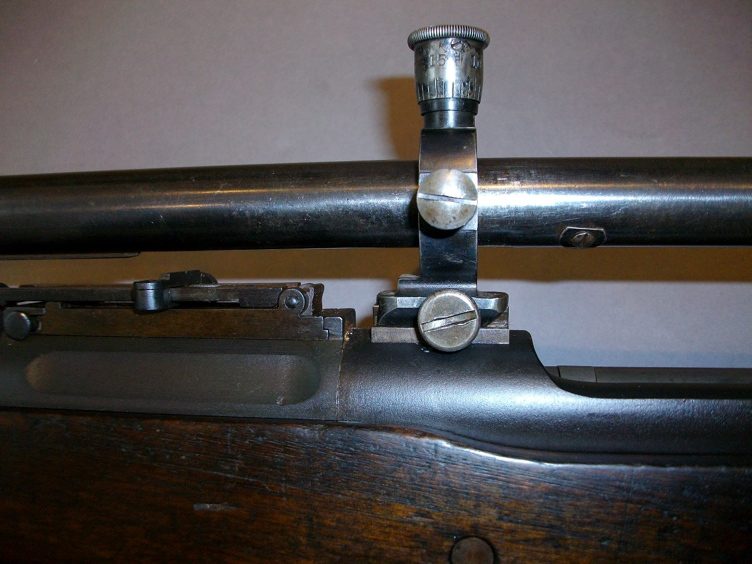 These were tapered requiring no locking screw to lock the mount in place, relying on the recoil of the rifle when fired to jam the mount tighter onto the base. It also omitted the ‘grass hopper spring’ which held the scope firm in the elevation and windage adjustment turrets in the rear mount, in favour of a spring plunger which did the same job. So when the Marines went to war in 1917 it was their ’03 Springfield, Winchester A5 combo match rifles that they took with them as their sniper arm. The Winchester A5 scopes were issued with leather carrying cases which had web shoulder straps – WWI cases were a modified brown leather ‘bucket’ commercial case – post WWI cases were black leather and a straight case. The Winchester A5 also saw extensive use by Britain and Empire forces. 900 were purchased and used by snipers during the early stages of the First World War. It was the only rifle scope to see unilateral use by the British, Canadians and US forces in WWI. The British Winchester A5’s were marked either with the rifle serial No. engraved on the tube infilled with red enamel or a Broad Arrow and Inspectors Mark on the mounts. The US marine A5’s were not marked in any way indicating military service. So now, any commercial A5 of the period is listed as a USMC ‘Sniper Scope’! When Winchester sold their scope manufacturing business to Lyman in 1928, Lyman continued to manufacture the A5, but made some minor improvements and marketed it as the Lyman 5A. Lyman added a ‘Pope-style’ rib to the underside of the telescope tube, which replaced the groove in the underside of the Winchester. The use of improved achromatic lenses in the Lyman 5A eliminated the problem of overlapping red and blue colours, sometimes seen at the edges of the original lenses. 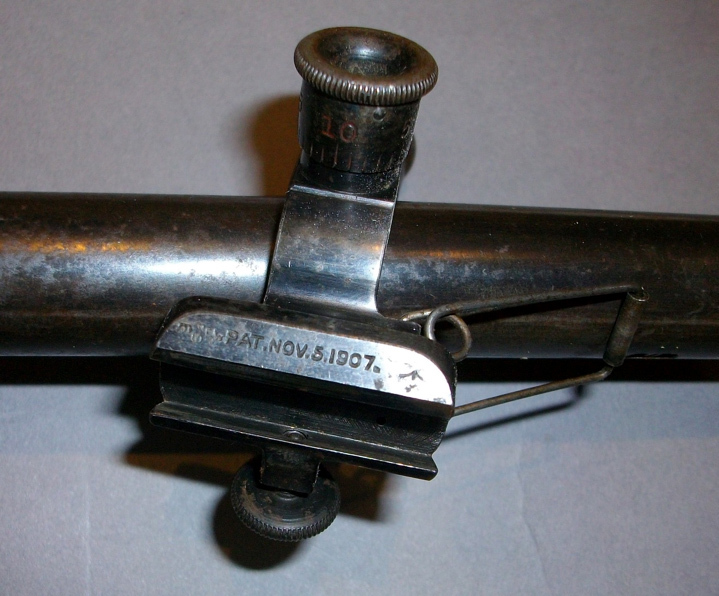 Lyman also replaced the ‘grass-hopper’ spring on the rear mount with an internally-mounted spring-driven stud in the bottom of the rear mount which held the tube securely against the windage and elevation screws. With the ‘V’ groove in the front mount to accommodate the ‘Pope rib’ the tube was held securely yet was still allowed to move smoothly forward under recoil. The Lyman 5A replaced the Winchester A5 in the Marine inventory on a one to one basis as needed. Although competitive match shooting flourished in the inter war years, developing the sniper arm had been placed on the back burner. 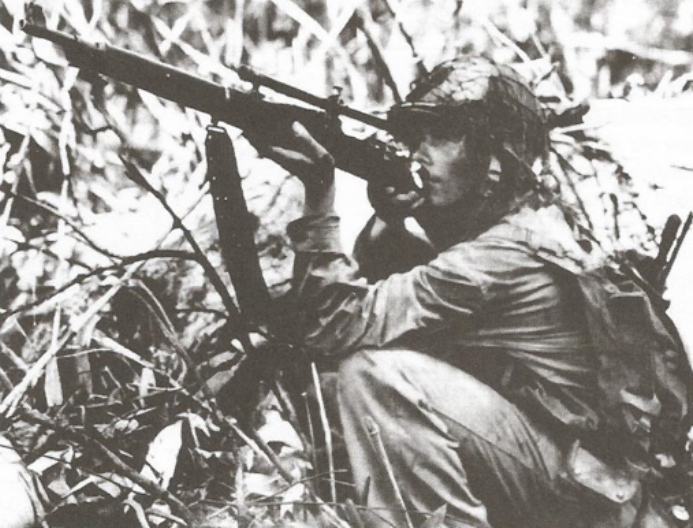 When the United States entered WWII ‘a tad late’ it was the ’03 Winchester/Lyman scope that the Marines pressed into service again as their sniper arm and used it early on in the Pacific Theatre, on an island that has become intrinsically linked into USMC history and marked the end of Japan’s advance in the Pacific – Guadalcanal. Because the Winchester A5 or Lyman 5A scopes were not marked indicating US Military service, it’s now virtually impossible to determine which were used. As only a relatively small number were mounted on 03’s by the USMC, originals (with provenance) are rare, so the majority of complete ’03 Springfield A5/5A sniper rifles seen for sale today are undoubtedly fake – some obviously so! But so long as a premium price has not been paid and collectively the complete rig only owes you the sum of its parts, then for the majority of us at least it’s an affordable way of obtaining a facsimile of one of the earliest USMC sniping rifles – and you are not afraid to shoot it either…… good fun ! !